Fill the cracks and the gaps. Mindy saw a need in fitness and then created a methodology to fill the need. There is a huge leap of faith that is taken when a person steps into the white powder, the snow or the path that has yet to be traveled. Is there a place where you see a need? Something yet to be created that could make the world a better place, help someone in need or fast track a persons way to success or potential? What would happen if you took your idea out into the world? If not now when? If not you – who? Making your mark and then make your money. Now I know it is not always possible to give up the income to pursue our passion. There are bills to be paid and this thing called life can be expensive – but if there is a passion burning inside of you, something that, while you may not make a living at it, you could make your mark? It is so important for us to be able to leave an impact, and if you are really lucky, maybe that also happens to be in the form of your job. Is there one thing you could do this weekend to leave a mark for good? A random act of kindness, paying your gratitude forward? Following through on volunteering – helping a neighbor in need? All of these leave an impression both in the world and in the hearts of those around you. Can you find the everyday magic? Bruce talked about his cancer diagnosis and how he went from living in a box of I am going to live forever and over into a box of I could die tomorrow. I often talk about the idea of the extra-ordinary in the ordinary, and how many times it can take a life-changing event to wake us up. A powerful tool that we can use to help assess if we are thriving or simply surviving is to ask ourself these questions, If this was my last year on earth a. who would I be with b.what would I be doing c. how would I want to feel? We can then look at that reflection and see how closely it matches up to our daily life. Perhaps this weekend you can make one small shift to move you closer to the life you “want” to be living. What is your why? Bruce and Mindy talk about goal setting and how it is important to know our why behind our goals. They encourage us to target our goals from every angle. Why are your goals important to you? How would your life change once you reach these goals ? And maybe the question, Why are you resistant to these goals? Mindy believes that when it comes to nutrition, which can be very hard to change, that it is important that we not only know our personal why, but also the scientific why? Is there one small nutritional change that you have been wanting to make? How would this change impact your energy? Your mood? Your creativity? What does the science say to support this action? Mindy reminds us that we like good news about our unhealthy habits – what does the news say that will support your decision to give up one small unhealthy habit and replace it with one small positive action step instead? How is your stress level? 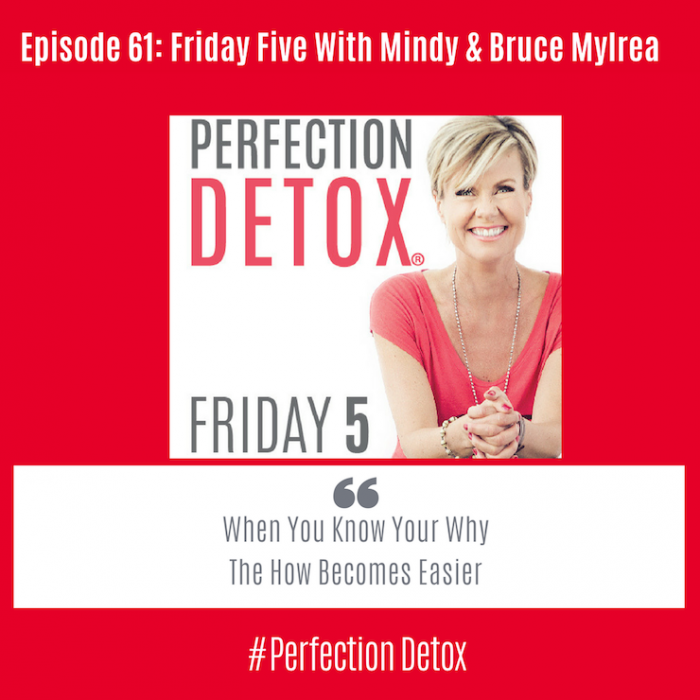 Bruce and Mindy remind us how important it is to manage our stress. Stress comes from all around us, our family, our job, the news and the social media scrolling. How is your stress level? Are you doing anything to manage and deal with your stress? How well do you feel during the day? How well do you sleep at night? Our breath is a wonderful anchor to check in with how well we are dealing with our stress. Begin by simply by placing one hand on your chest and one hand on your belly. Notice which hand is moving more. Can you deepen your breath to allow the air to float more deeply into your belly. Breathe so that your top hand and becomes still and your lower hand begins to move more. One breath at a time, one moment at a time we can help downgrade our anxiety and our stress and upgrade how we show up in our day: present, alert and ready to deal with what is in front of us.